Smells like some amazing tees! Founded by Kurt Cobain, Nirvana were one of the most influential and important rock bands in the modern era, delivering angsty anthems for disaffected teens around the world - most famously on their dense, noisy second album Nevermind with its soaring rock singles like Smells Like Teen Spirit and Come As You Are. 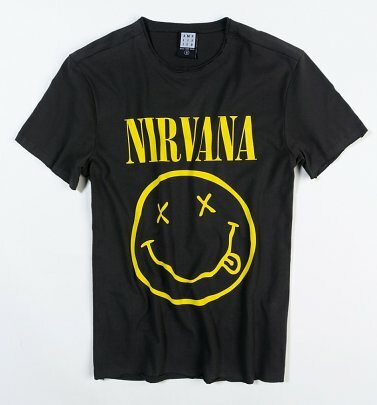 Pay homage to the famous purveyors of grunge with our official Nirvana T-Shirts - from the iconic black and yellow Smiley tee design, to an awesome photographic tee celebrating the last song recorded by the band, 'You Know You're Right.' Or try a subtle '90s tribute with our lilac and gold plated Nirvana necklaces and rings, from super-fun, pop-culture jewellery brand Me and Zena.